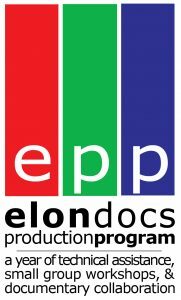 Students who are accepted into the one-year elondocs production program participate in technical training, project workshopping, and the production of audio, photo and video documentaries. Members of the program also attend the Full Frame Documentary Film Festival as student fellows. For more information, contact Nicole Triche, program adviser, at ntriche@elon.edu or 336-278-5808.